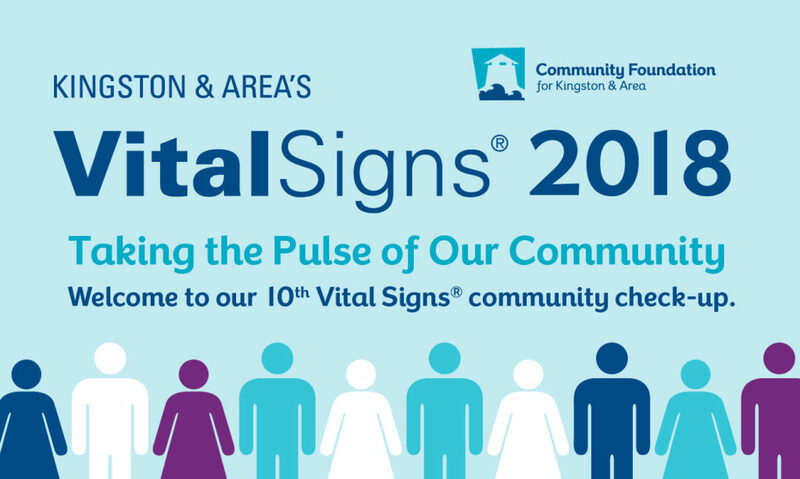 We are pleased to release our 10th anniversary edition of Vital Signs®, our annual community report card. With ten years of data available, this year’s reports look at trends since our first publication to identify areas where we are seeing improvement and areas where we are not. It analyzes selected 2016 Census data for Kingston and area, focusing on issues most critical to wellbeing within the community. One of the key messages from this year’s report is that the overall health of the community is strongly linked to a ‘sense of belonging’. The “sense of community belonging” is strong in Kingston, with a measured 5% increase over the previous decade. However, charitable giving is barely keeping up with inflation and charities are now relying on fewer donors giving more. The Calls to Action of the Truth and Reconciliation Commission have sparked some positive changes for the Indigenous population of the community. The City of Kingston has been effective in providing leadership, but there is an enormous amount of work to do to raise the incomes, reduce the unemployment rate, and lift Indigenous individuals and families above the poverty level. In the decade 2005 to 2015 there was no significant reduction of poverty in the Kingston area; indeed the rate rose slightly. In 2010 the City of Kingston, with the United Way undertook a Poverty Reduction Initiative to address poverty; nevertheless, lone parents, Indigenous residents, visible minorities, and recent immigrants have rates of poverty in excess of the overall 13% poverty rate, with some vulnerable groups approaching a rate of 25%. We have seen marked advances in several other areas of our community such as; an increase in youth employment, a rise in cultural diversity, and an increase in sustainability efforts to reduce carbon emissions and to promote health and wellbeing. There remain areas of concern with the increase in the incidence of obesity and overweight in our region. Both obesity and addiction are often linked to poor mental health. Over the decade ending 2015-16, the rates of self-reported “fair” or “poor” mental health increased from less than 6% to over 8%. For Addiction and Mental Health Services – KFLA, addiction and mental health deficits translated into 16,068 calls to their crisis line, 7,690 individuals accessing services, and 322 receiving housing support. The sharp rise of opioid use in recent years has presented new challenges to our community. The death rate in KFL&A is higher than the provincial average with a 46% increase of opioid related deaths between 2016 and 2017 alone. It has been identified that Kingston will start to experience a labour shortage soon, unless steps are taken now to increase the skilled labour force. The United Way of KFL&A’s Youth Employment Strategy Task Force reported to the City of Kingston in August 2016 that we need to: help youth start planning early, develop pre-employment skills, facilitate mentoring, and make employers part of the solution. Comparing the 2006 and 2016 data, Kingston CMA’s visible minority population is making little progress towards approaching the Ontario and national percentage of the population levels with (in 2016) 8% of Kingston’s population being visible minorities compared with 29% in Ontario and 22% nationally. However, the composition of recently arrived immigrants in Kingston CMA is changing significantly. Almost 74% of recent foreign-born newcomers belong to a visible minority compared to 12% of those who arrived prior to 1981. Click here for an electronic copy of Vital Signs 2018 or contact the office to request a hard copy. Click here for additional resources including references and speaker presentations.